There are more than ten popular black granite in world.Colors such as absolute black also called shanxi black, mongolia black also called china black, black galaxy, hebei black, fengzhen black, sesame black, g654, fuding black, g684, china black pearl, raven black, black galaxy from india, nero belfast from south africa. We can supply all of these granite color products countertop, vanity top, bar top, table top, kitchen vanity top, window sill, steps, stair, tile, slab, wall cladding, shower surround, paving flooring,surface processing polished,honed,mushroom, bush-hammered, pitched,nature.Countertop edges eased&polished,2cm full bullnosed, 2cm+2cm laminated full bullnose, dupont, ogee, ogee bullnose, waterfall, half bullnose, 3/8 inches radius top, radius top&buttom, bevel polished. Absolute black is a pure black granite from shanxi province China.Sometimes it is also called shanxi black,We own a quarry of absolute black. These black colors granite is widely used in interior and exterior.We export absolute black granite tiles,slab, kitchen countertops, table top,night top,threshold,coffee top, banjo top, bathroom vanity tops,worktops, bar tops,Island tops,table tops, bathroom sinks, tombstone, headstone, monument, bathroom sink, stairs, faucets,blocks to USA, Canada, Europe, Australia, Africa etc. 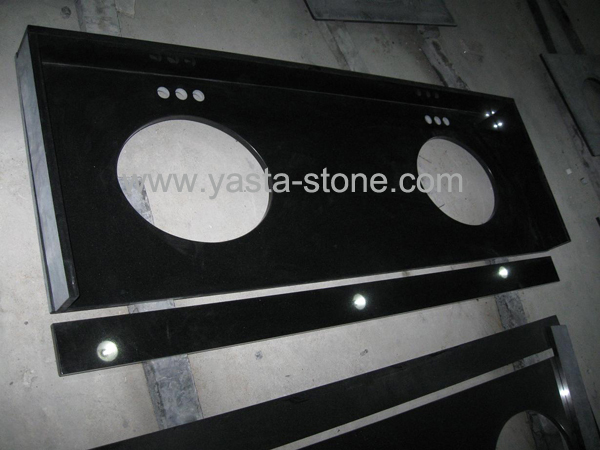 Black granite vanity tops for bathroom,washing room, hotel, inn, hosing,public restroom .Granite vanity top type such as wall vanity top,banjo vanity,bowed vanity top,granite thresholds,vanitytops with two bowles polished sink cut out,night top,coffee top,thresholds size 6"x36',2"x36",7"x36" with two polished bevel side.Countertops size 72"x36"x3/4",kitchen vanity top width 25 1/5 inches,night top size 36"x24"x3/4". Black granite vanity top with 2cm thickness full bullnose one short&long edges,undermount sink cut out,one faucet hole processing.Absolute black slab,shanxi black polished slabs size 1200mm upx2400mm upx20mm/30mm.Black granite tile size 12"x12"x3/8",16"x16"x1/2",24"x24"x3/4",tiles finishging including such as polished,honed,mushroom etc..
Absolute black sink,basin,bowls and granite tops are avaliable supplied by us.